Over the years, one single flavor has come to encompass an entire quarter of the year: autumn is given to pumpkin spice. The distinctive blend of cinnamon, nutmeg, ginger, and allspice may have been born decades ago to give some warmth and depth to seasonal pumpkin pies, but it really took on a life of its own when Starbucks unleashed the Pumpkin Spice Latte upon the world in 2003. 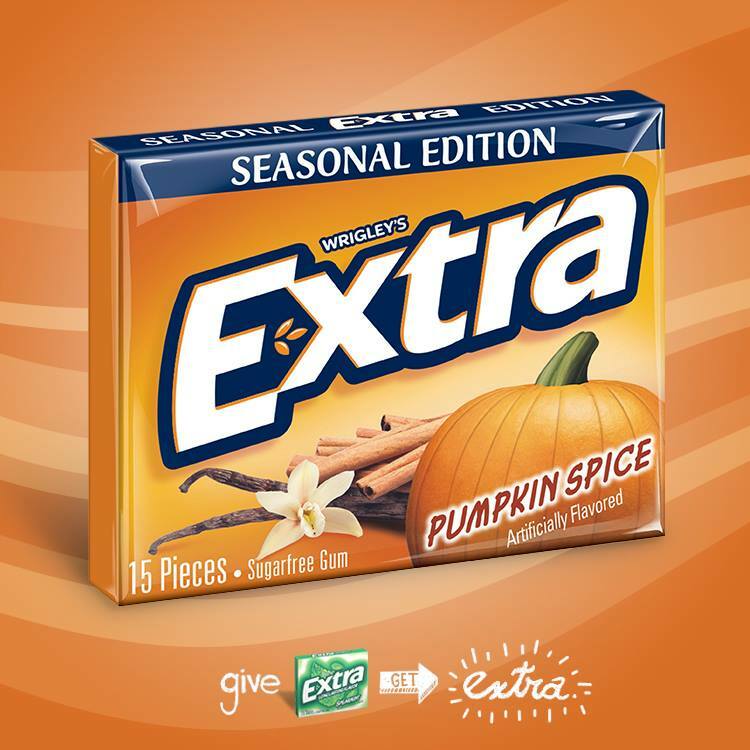 Ever since, we’ve been on a slow and inexorable march toward pumpkin spice critical mass. Here are ten signs that it might be time to step away from the nutmeg for a while and leave it to the pie. 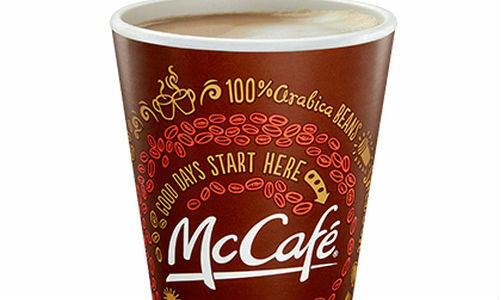 Pumpkin Spice Lattes may have started out as a way for Starbucks to differentiate itself during the pre-holiday season, but now it’s bleeding out into other chains and franchises who have recognized its draw. Sometimes you don’t have time to wait in line for a professional Pumpkin Spice Latte, so you go for the more convenient at-home treatment. 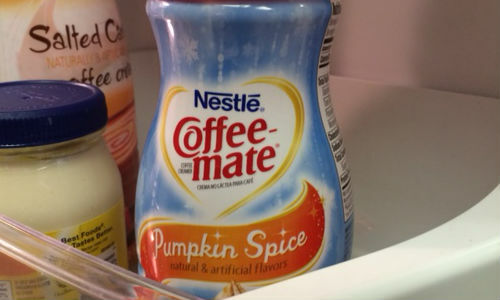 With this, the tools to create a pumpkin spice latte can be everywhere—literally everywhere, even the FDF World break room refrigerator. 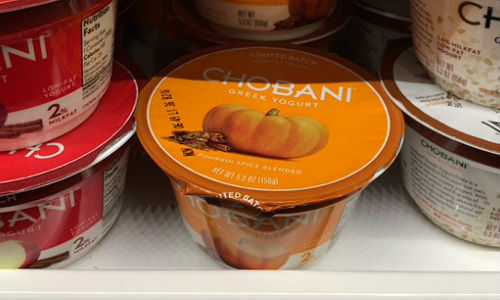 Yogurt has a long tradition of trying to dress up its health appeal with flavors like Boston Cream Pie and Chocolate Mousse, so it was only a matter of time before pumpkin spice took hold. This is your go-to energy bar when you need to harness the power of warmth and coziness to get you through your workout. 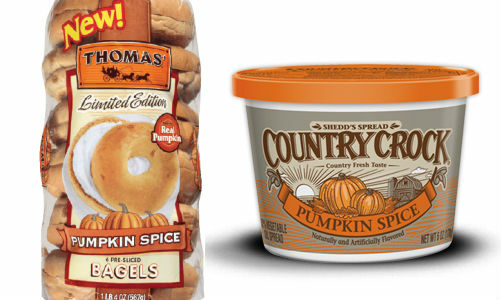 You have to choose: pumpkin spice bagels topped with regular spread, or pumpkin spice spread on a regular bagel. We’re trying to imagine what it would taste like to have both at the same time, and it’s just too much. Hummus is chickpea-based dip for chips and pita bread, and should probably stay firmly rooted over on the savory side of the spectrum. But that’s not going to stop the pumpkin spice train from rolling through. It doesn’t sound like a logical choice for breath freshening, since many people chew gum to eliminate coffee breath. Then again, spicy cinnamon gum is pretty delicious and perhaps this can tide a consumer over until the next coffee break. 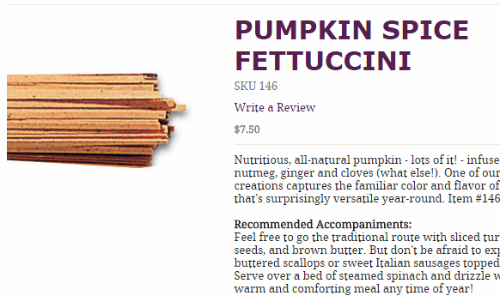 What kind of sauce would one serve with pumpkin spice fettuccine? Certainly not marinara. The manufacturer recommends brown butter or sage butter with other signifiers of fall like turkey and pumpkin seeds. 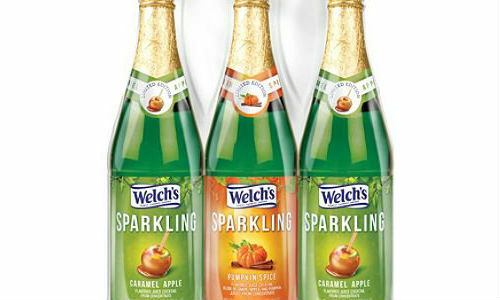 Sparkling cocktails are always a great non-alcoholic addition to the holiday dinner table, but how about one with the cool, refreshing flavor of—pumpkin spice? Sure, why not. After all, it’s the perfect mixer for #1. On the one hand, can we not just pour normal original-flavored alcohol into a Starbucks PSL like an especially festive Irish Coffee and call it a day? 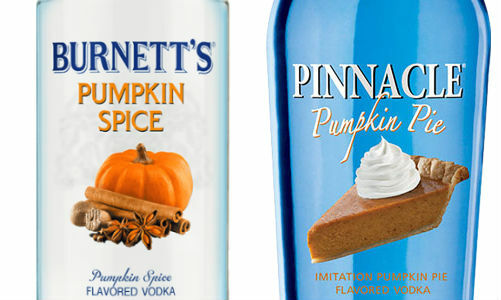 On the other hand, why take up valuable stomach space with a pumpkin spice latte when you could be filling that space with more vodka? 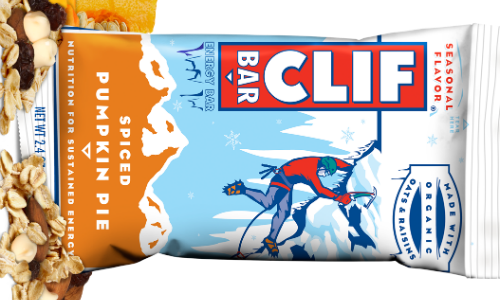 Okay, this is some pumpkin spice we can really get behind.